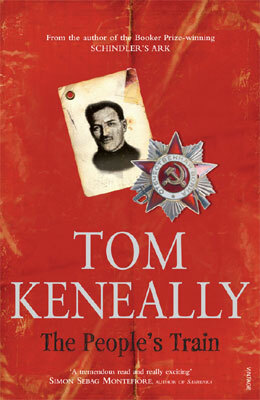 As Schindler's Ark followed the fortunes of Oskar Schindler against the back-drop of WW2, Tom Keneally now turns to the Russian Revolution and uses the real-life story of a hitherto unknown revolutionary to cast light on a turning point in world history. In The People's Train, Artem Samsurov reaches Australia in 1911 after escaping from a Siberian labour camp. A protégé of Lenin, he arrives in Brisbane determined to affect change amongst the works, but his more hardline revolutionary ideals to do not endear him to the local socialists. Against the backdrop of strikes and political agitating, Samsurov not only falls in love with a married woman, but is implicated in the murder of a fellow Russian. His dreams of a workers paradise begin to become more and more elusive as he works to disentangle himself from these two events. On return to Russia, the story is taken up by an Australian journalist and we see not only Artem Samsurov through his eyes, but the machinations surrounding the early days of the Russian Revolution and the overthrow of the Winter Palace. In The People's Train, Tom Keneally is able to effortlessly weave historical fact with fictional imaginings. His ability to capture these moments in time leave an indelible mark on the reader's consciousness. Whether it be the small town feel of sleepy Brisbane in 1911 or the passion and energy of the Russian Revolution, Tom is a master of conveying time and place. His characters are fully realised with their virtues and foibles on display. Once again the Booker Prize winning novelist, Tom Keneally has shown that he's one of Australia's leading writers. Thomas Keneally was the Booker Prize in 1982 with Schindler's Ark, later made into the Academy Award-winning film Schindler's List by Steven Spieldberg. He has written ten works of non-fiction, including his recent memoir Searching for Schindler and the histories The Common-wealth of Thieves, The Great Shame and American Scoundrel, and 27 works of fiction, including The Widow and her Hero (shortlisted for the Prime Minister's Literary Award), An Angel in Australia and Bettany's Book. His novels The Chant of Jimmy Blacksmith, Gossip from the Forest and Confederates were all shortlisted for the Booker Prize, while Bring Larks and Heroes and Three Cheers for the Paraclete won the Miles Franklin Award.